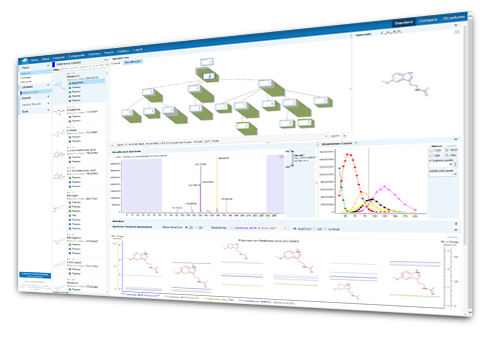 mzCloud is a state of the art mass spectral database that assists analysts in identifying compounds in areas such as life sciences, metabolomics, pharmaceutical research, toxicology, forensic investigations, environmental analysis, food control and various industrial applications. mzCloud™ features a freely searchable collection of high resolution/accurate mass spectra using a new third generation spectra correlation algorithm. Online access to the database is free of charge and no registration is required. To open our full database visit us using a desktop browser (e.g. Internet Explorer) on your laptop or desktop computer. Watch a video to see how to access our database. Individual MSn spectra search against mzCloud library to retrieve structural or substructural hits. Query spectrum can be imported from a file. Find exact structures in the mzCloud library without the hassle of using organic nomenclature. Structure queries can be drawn using the integrated Structure Editor. Find all compounds that contain a particular substructure or fragment using the various search options. A substructure query can be drawn using the integrated Structure Editor. Confident compound or substructure identification using a tree or subtree search. Spectral trees can be imported from raw files or from an Excel file. Retrieve spectra and structures that exhibit peaks with a particular m/z value or molecular mass. Accuracy/tolerance interval can be set automatically or by the user. Search for IUPAC, trivial, commercial names and synonyms. The text string can be searched anywhere in the name.